Another intriguing vehicle that caught our attention at the 2014 LA Auto show was the new Chevrolet Colorado ZR2 Concept Truck featuring a 2.8-liter Duramax Diesel engine. This vehicle shows firsthand how Chevrolet is serious in the business of capable trucks and listening to the enthusiasts who want an efficient but powerful diesel powertrain. This is that and more. Check it! LOS ANGELES – Chevrolet today introduced the Colorado ZR2 concept – a vision of how Chevrolet could take the all-new midsize truck’s off-road capability to the next level. It also showcases the new 2.8L Duramax diesel engine that will arrive in the Colorado lineup later next year. 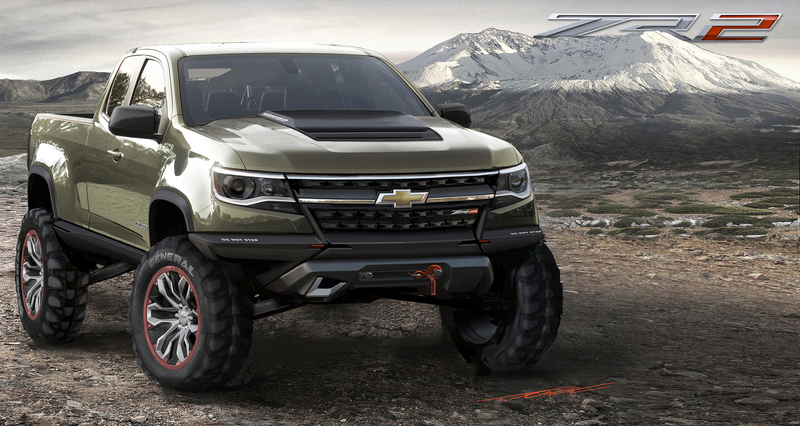 The aggressively styled concept builds on the capabilities of the production Colorado Z71 and advances the legacy of Chevrolet’s previous ZR2 production models. The Colorado ZR2’s imposing stance is four inches wider than a production Colorado Z71, with features including new front and rear fascias designed to increase approach and departure angles when driving off road. Ground clearance and rough terrain are handled with a two-inch lift and integral skid plates, while the wider track helps enhance stability in potentially unstable situations. The Colorado ZR2’s greater apprach and departure angles – 30.7 and 22.7 degrees, respectively, versus the Z71’s 25/21 degrees – are enabled by all-new off-road fascias that drastically reduce front and rear overhang. They also feature integrated, flip-out aluminum tow hooks and the front fascia incorporates a built-in winch. Mono-tube coil-over shock absorbers by King™ are designed for greater suspension travel and feature remote-mounted fluid reservoirs that add to the Colorado ZR2 concept’s capability. The reservoirs for the front shocks are accessible and mounted in the wraparound portion of the front fascia, while the capability of the shocks is matched with all-new front control arms. Off-road traction is enhanced with electronic-locking front and rear differentials, which distribute torque to 275/65R18 off-road tires mounted on custom 18-inch aluminum multi-spoke, bead-lock-style wheels. The center section of the wheel design has a raw aluminum appearance with black accents, while the bolt-on bead lock cover is orange-anodized aluminum. Custom wheel flares cover the larger off-road tires and increased track width, enhancing the truck’s purposeful stance. They’re complemented by custom rocker guards. A matching spare wheel/tire assembly, with a quick-release handle, is mounted in the bed. The bed also features the protective spray-in bed liner available with production Colorado models, GearOn™ accessories and a 48-inch Hi-Lift jack – all necessities for the trail. Additional exterior elements include an all-new grille and headlamp housings with blacked-out accents. 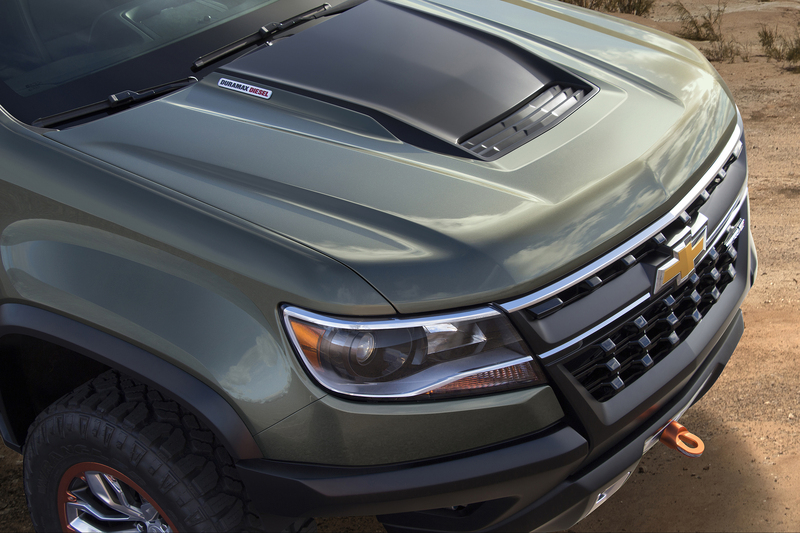 The power dome-style hood is unique and echoes the design cues of Chevrolet’s Duramax-powered Silverado heavy-duty trucks. The Colorado ZR2 wears a concept Cyprus Green exterior color, with Henna Orange accents and custom ZR2 identification on the rear fenders, tailgate and grille. Inside, the concept off-roader features the same blend of capability and comfort found in the production Colorado Z71, with ZR2 logos embroidered on the front-seat headrests and embossed in the custom Chevrolet Accessories-based floor liners. The ZR2 logo is featured on the instrument cluster display, as well as a custom inclinometer that shows degree of incline from front to back, and side to side. Additional electronic accessories have been added to the center stack to make the Colorado ZR2 a true off-road warrior. Incorporated into the piano key bank is AUX toggle and four additional toggles: two for winch in and winch out operation; and two for the electronic front- and rear-locking differentials. The Jet Black leather-trimmed interior features orange stitching that complements the exterior’s orange accents. The Colorado ZR2 concept’s new 2.8L Duramax diesel packs the power – an estimated 181 horsepower at 3,400 rpm and 369 lb-ft of torque at 2,000 rpm – to tackle the toughest trails. The 2.8L Duramax diesel is part of a new, global family of turbo-diesel four-cylinder engines designed to deliver more-efficient capability. It features a variable-geometry turbocharger for optimal power and efficiency across the rpm band and a balance shaft for greater smoothness. FAST FACT: Chevrolet introduced the ZR2 in 1994 on the compact S-10 pickup. It was added to the S-Series Blazer in 1996. It was available through 2003 on the S-10 and in 2005 on the Blazer. Chevrolet also offered the off-road-inspired S-10 BAJA from 1988 through 1991. 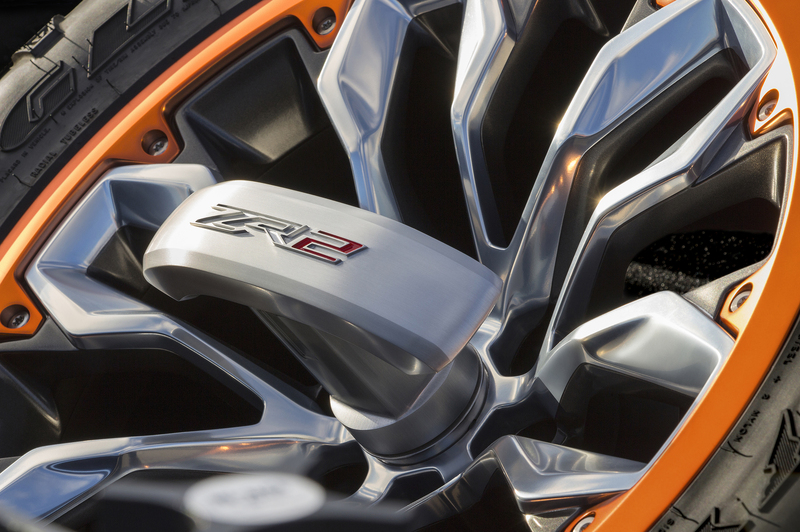 Like the Colorado ZR2 concept, it was available with a racing-inspired bed-mounted spare tire.